The aim of this chapter is to give you a rough oversight about the configuration of a MIDIbox NG before your are working through the details of the .NGC, .NGL and .NGR format. First of all it makes sense to get familiar with MIOS Studio and especially the integrated MIOS Filebrowser, because it will enable you to try out changes in your MIDIbox NG setup quickly by editing the configuration files, and transfering the changes via USB-MIDI. The DEFAULT files will be automatically generated if they don't exist on the connected SD Card. After a click on the "Update" button, files can be uploaded/downloaded from/to your harddisk - but it's especially possible to edit files without the need for an external text editor! The filename has to be specified without the .NGC extension. Let's start with the obligatory "Hello World" example. Unfortunately this experiment will only work with a LCD which is connected to your core module. In MIOS Filebrowser, create a new configuration file by clicking on the "Create File" button. Name it "hello.ngc", and then click on the "Update" button to re-scan the directory. 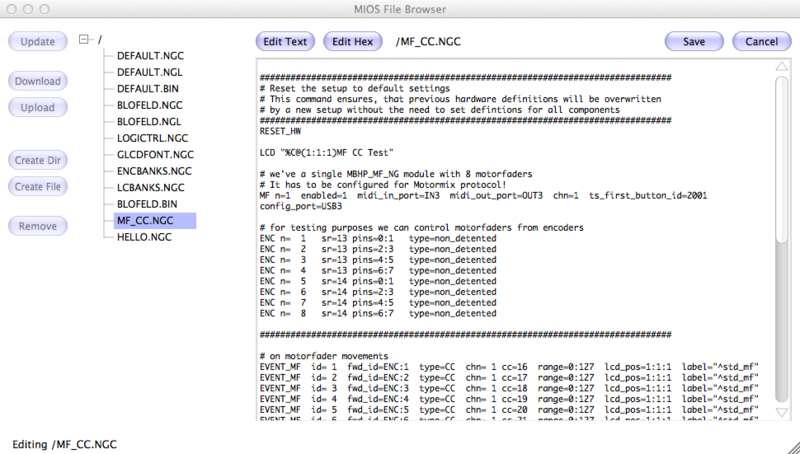 Click on the "HELLO.NGC" file and push the "Edit Text" button. Click on the "Save" button. The AUTOLOAD function should automatically execute the "load hello" command after upload. Your LCD should show the message now! Note: detailed informations about the commands which are mentioned at this page can be found in the .NGC chapter. This is probably also the best place to mention, that filenames (without the .NG* extension) are limited to 8 characters! The next experiment will work if a DIN shift register (e.g. of a MBHP_DIN or MBHP_DIO_MATRIX module is connected to J8/9 of the core module. We want to generate a Note event with a button connected to the D0 pin of the first shift register. The appr. button ID is 1. Push the button - it should send a Note On event with C-1, velocity 127. When you release the button, it should send C-1 with velocity 0, which equates to NoteOff. These events are displayed in the MIDI IN monitor of MIOS Studio in hexadecimal format (in this case: 90 24 7F when pressed, and 90 24 00 when depressed) and in text format. ...but in some situations it might be helpful to have more! Important: the MIDI IN monitor of MIOS Studio won't display this event, because it only allows to select a single input port. Select the second USB port of your MIDIbox NG to display the event, or just run a second MIOS Studio instance, or a different MIDI monitor (such as the Snoize MIDI Monitor for MacOS or MIDI-Ox for Windows). Now we want to display the button movement on our LCD, because the "Hello World!" message gets boring. EVENT_BUTTON id=1  type=NoteOn key=36  lcd_pos=1:1:1 label="Button #%3i: %3d"
This experiment requires a DOUT shift register (e.g. of a MBHP_DOUT or MBHP_DIO_MATRIX module connected to J8/9 of the core module) in addition. The anode (long leg) of the LED should be connected at D7 (the first (leftmost) DOUT output pin), the cathode (short leg) to Vs (ground). Beware: the J10 ports and the MBHP_DIO_MATRIX module have no series resistor for the LED! Please use a 220 Ohm resistor between Anode (long leg) and the output pin, otherwise the LED will be fried! EVENT_BUTTON id=1  fwd_id=LED:1  type=NoteOn key=36  lcd_pos=1:1:1 label="Button #%3i: %3d"
The LED should turn on while you are pressing the button. 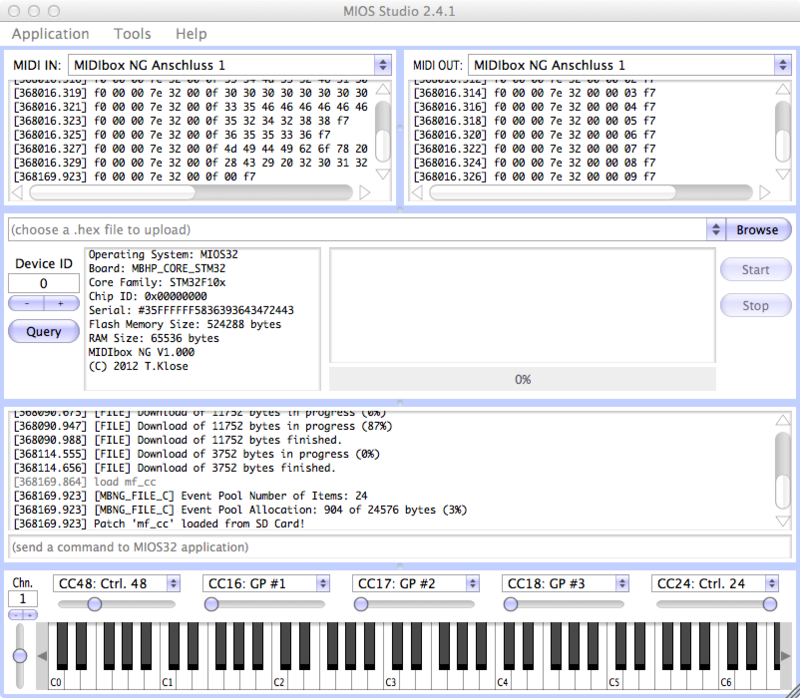 With the previous EVENT_BUTTON statement, play MIDI Note C1 on the virtual MIDI keyboard of MIOS Studio. The LED should be lit whenever you are clicking with the mouse on the lower boundary of the C1 key of the virtual keyboard (velocity has to be >= 64, check this in the MIDI OUT monitor). If you click a bit more higher, the LED won't turn on because the velocity is below the half of the specified range. In other words: the LED will only be lit if the received velocity is greater than int((127-0)/2) = 63. Velocities which are <= this value will turn off the LED. EVENT_BUTTON id=1  fwd_id=LED:1 dimmed=1  type=NoteOn key=36  lcd_pos=1:1:1 label="Button #%3i: %3d"
Only the dimmed=1 parameter has been added. The LED will change the brightness over the 0..127 value range in 16 levels. Ok, this demonstration should also show you, that it's possible to send SysEx streams, and that multiple lines in the configuration file can be concatenated to a single command with the backslash (\) character. Let's get serious again! A typical usecase for buttons is to switch between different modes of an external device. If the mode has to be configured over a single CC event, you need to assign multiple buttons. In conjunction with LEDs it would be nice if only the LED which matches with the mode selection is lit, and that all others are off. This behaviour can be configured with so called "Radio groups" (see also this Wikipedia article about Radio Buttons). They are all assigned to the same radio group 1 (note that up to 63 groups are available!). Now push the buttons one after another. Only the LED of the pressed buttons should be activated, all others will be turned off. Next step: send a CC16 event from MIOS Studio (take a slider above the virtual keyboard). The LEDs should change their state corresponding to the received value. The same can be done without buttons, but only with LEDs. And it's also possible to select larger value ranges for a radio group! We are coming to the next control element: a Rotary Encoder. In this example it's assumed, that 8 rotary encoders are connected to the third and fourth DIN shift register of your MBHP_DINX4 module. Of course, you are free to use different DIN SRs for this, please adapt your configuration accordingly by changing the "sr=<shift-register-number>" assignment. Channel A and B of the encoder have to be connected to pin D0/D1, D2/D3, D4/D5 or D6/D7. The third pin has to be connected to ground. Some encoders have the ground at the middle pin, some others at the left or right pin - please consult the datasheet of the encoder that you bought! and check if the increments are notified correctly after each "click". If the increments are inversed (-1 on clockwise movements), then you've probably swapped the connections between channel A and B of the encoder. In this case, please fix your hardware connections (this can't be changed in the configuration). Encoder: send MIDI - now! Your encoders will now send CC#16 .. CC#23 events, which should be displayed in the MIDI IN monitor of MIOS Studio! The big advantage of those encoders is, that they can take over incoming MIDI values, and modify them without the danger of "value jumps" when the encoder is moved again to modify the value (in other words: it will be on-synch to the remote device if it sends its own value changes as well). 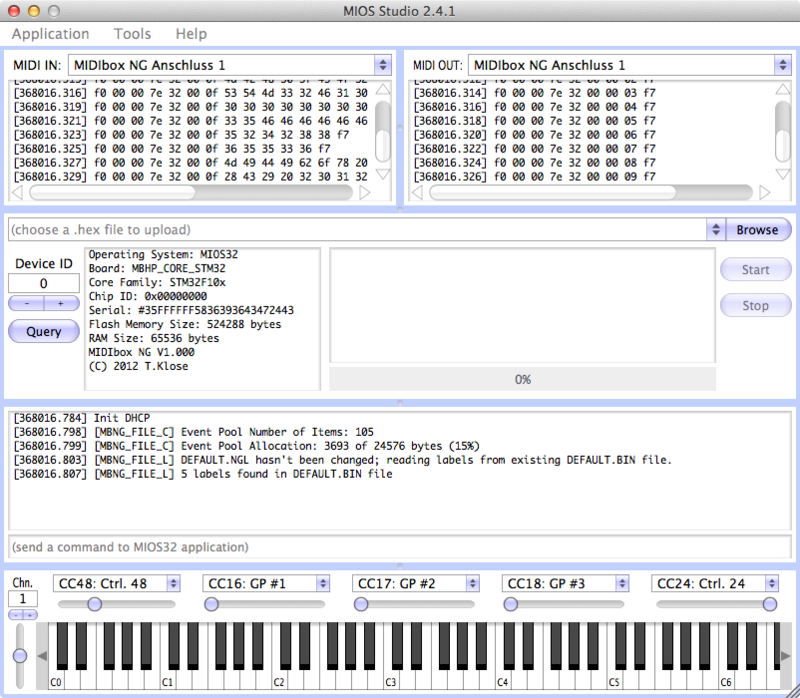 So, the next experiment will be, to send a CC#16 event to your MIDIbox NG, e.g. with the slider above the virtual keyboard in MIOS Studio. E.g. move the slider so that it sends CC#16 = 64 (check this with the MIDI OUT monitor of MIOS Studio). Now move the first encoder: it should increment/decrement from this received value! EVENT_ENC id=1  type=CC chn= 1 cc= 16  lcd_pos=1:1:1  label="ENC #%3i    %3d%B"
EVENT_ENC id=2  type=CC chn= 1 cc= 17  lcd_pos=1:1:1  label="ENC #%3i    %3d%B"
EVENT_ENC id=3  type=CC chn= 1 cc= 18  lcd_pos=1:1:1  label="ENC #%3i    %3d%B"
EVENT_ENC id=4  type=CC chn= 1 cc= 19  lcd_pos=1:1:1  label="ENC #%3i    %3d%B"
EVENT_ENC id=5  type=CC chn= 1 cc= 20  lcd_pos=1:1:1  label="ENC #%3i    %3d%B"
EVENT_ENC id=6  type=CC chn= 1 cc= 21  lcd_pos=1:1:1  label="ENC #%3i    %3d%B"
EVENT_ENC id=7  type=CC chn= 1 cc= 22  lcd_pos=1:1:1  label="ENC #%3i    %3d%B"
EVENT_ENC id=8  type=CC chn= 1 cc= 23  lcd_pos=1:1:1  label="ENC #%3i    %3d%B"
If you are confused about the strange "format specifiers" (starting with %), have a look into the .NGC format specification, search for "label=<string>"
Let's play a bit with the labels. The example above overwrites the previous string whenever a different encoder is moved. But what if you want to get an oversight over all encoders - at least a vertical meter for each encoder? EVENT_ENC id=1  type=CC chn= 1 cc= 16  lcd_pos=1:1:1  label="ENC #%3i    %3d@(1:1:2)%B"
EVENT_ENC id=2  type=CC chn= 1 cc= 17  lcd_pos=1:1:1  label="ENC #%3i    %3d@(1:2:2)%B"
EVENT_ENC id=3  type=CC chn= 1 cc= 18  lcd_pos=1:1:1  label="ENC #%3i    %3d@(1:3:2)%B"
EVENT_ENC id=4  type=CC chn= 1 cc= 19  lcd_pos=1:1:1  label="ENC #%3i    %3d@(1:4:2)%B"
EVENT_ENC id=5  type=CC chn= 1 cc= 20  lcd_pos=1:1:1  label="ENC #%3i    %3d@(1:5:2)%B"
EVENT_ENC id=6  type=CC chn= 1 cc= 21  lcd_pos=1:1:1  label="ENC #%3i    %3d@(1:6:2)%B"
EVENT_ENC id=7  type=CC chn= 1 cc= 22  lcd_pos=1:1:1  label="ENC #%3i    %3d@(1:7:2)%B"
EVENT_ENC id=8  type=CC chn= 1 cc= 23  lcd_pos=1:1:1  label="ENC #%3i    %3d@(1:8:2)%B"
This will display the state of each encoder at the second LCD line - we selected it with the @(<lcd>:<X>:<Y>) specifier. You may have already noticed, that the LCD message isn't updated when the encoder value is changed from external (e.g. from a slider in MIOS Studio). The reason is, that incoming MIDI events won't trigger a LCD message by default (because this could be unwanted under certain situations). EVENT_ENC id=1  fwd_to_lcd=1  type=CC chn= 1 cc= 16  lcd_pos=1:1:1  label="ENC #%3i    %3d@(1:1:2)%B"
EVENT_ENC id=2  fwd_to_lcd=1  type=CC chn= 1 cc= 17  lcd_pos=1:1:1  label="ENC #%3i    %3d@(1:2:2)%B"
EVENT_ENC id=3  fwd_to_lcd=1  type=CC chn= 1 cc= 18  lcd_pos=1:1:1  label="ENC #%3i    %3d@(1:3:2)%B"
EVENT_ENC id=4  fwd_to_lcd=1  type=CC chn= 1 cc= 19  lcd_pos=1:1:1  label="ENC #%3i    %3d@(1:4:2)%B"
EVENT_ENC id=5  fwd_to_lcd=1  type=CC chn= 1 cc= 20  lcd_pos=1:1:1  label="ENC #%3i    %3d@(1:5:2)%B"
EVENT_ENC id=6  fwd_to_lcd=1  type=CC chn= 1 cc= 21  lcd_pos=1:1:1  label="ENC #%3i    %3d@(1:6:2)%B"
EVENT_ENC id=7  fwd_to_lcd=1  type=CC chn= 1 cc= 22  lcd_pos=1:1:1  label="ENC #%3i    %3d@(1:7:2)%B"
EVENT_ENC id=8  fwd_to_lcd=1  type=CC chn= 1 cc= 23  lcd_pos=1:1:1  label="ENC #%3i    %3d@(1:8:2)%B"
The next step - and this is really an advanced one - will be to use LED Rings for displaying the state of each rotary encoder. The (non-existing) Hardware Chapter describes, how the circuitry looks like. Actually it doesn't matter, if you are building the circuit based on the given schematic, or customize it, e.g. only for 8 LED Rings, or with a different number of LEDs per ring. 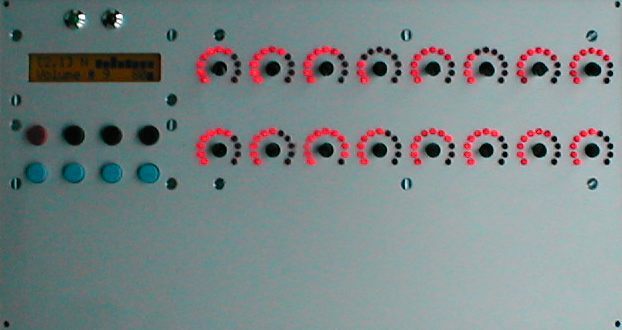 Anyhow, as you can see in the definitions above, the matrix allocates four DOUT shift registers to select the 16 rows, and to output the pattern. The pattern is predefined for 11 LEDs, but could also be changed for any number of LEDs with the LED_MATRIX_PATTERN command. It might be necessary that you adapt the shift register (sr*=) definitions to your hardware, depending on which shift registers (SRs) your encoders and LED Rings are located! EVENT_ENC id= 1  fwd_id=LED_MATRIX:1   fwd_to_lcd=1  type=CC chn= 1 cc= 16  label="ENC #%3i    %3d@(1:1:2)%B"
EVENT_ENC id= 2  fwd_id=LED_MATRIX:2   fwd_to_lcd=1  type=CC chn= 1 cc= 17  label="ENC #%3i    %3d@(1:2:2)%B"
EVENT_ENC id= 3  fwd_id=LED_MATRIX:3   fwd_to_lcd=1  type=CC chn= 1 cc= 18  label="ENC #%3i    %3d@(1:3:2)%B"
EVENT_ENC id= 4  fwd_id=LED_MATRIX:4   fwd_to_lcd=1  type=CC chn= 1 cc= 19  label="ENC #%3i    %3d@(1:4:2)%B"
EVENT_ENC id= 5  fwd_id=LED_MATRIX:5   fwd_to_lcd=1  type=CC chn= 1 cc= 20  label="ENC #%3i    %3d@(1:5:2)%B"
EVENT_ENC id= 6  fwd_id=LED_MATRIX:6   fwd_to_lcd=1  type=CC chn= 1 cc= 21  label="ENC #%3i    %3d@(1:6:2)%B"
EVENT_ENC id= 7  fwd_id=LED_MATRIX:7   fwd_to_lcd=1  type=CC chn= 1 cc= 22  label="ENC #%3i    %3d@(1:7:2)%B"
EVENT_ENC id= 8  fwd_id=LED_MATRIX:8   fwd_to_lcd=1  type=CC chn= 1 cc= 23  label="ENC #%3i    %3d@(1:8:2)%B"
EVENT_ENC id= 9  fwd_id=LED_MATRIX:9   fwd_to_lcd=1  type=CC chn= 1 cc= 24  label="ENC #%3i    %3d@(1:9:2)%B"
EVENT_ENC id=10  fwd_id=LED_MATRIX:10  fwd_to_lcd=1  type=CC chn= 1 cc= 25  label="ENC #%3i    %3d@(1:10:2)%B"
EVENT_ENC id=11  fwd_id=LED_MATRIX:11  fwd_to_lcd=1  type=CC chn= 1 cc= 26  label="ENC #%3i    %3d@(1:11:2)%B"
EVENT_ENC id=12  fwd_id=LED_MATRIX:12  fwd_to_lcd=1  type=CC chn= 1 cc= 27  label="ENC #%3i    %3d@(1:12:2)%B"
EVENT_ENC id=13  fwd_id=LED_MATRIX:13  fwd_to_lcd=1  type=CC chn= 1 cc= 28  label="ENC #%3i    %3d@(1:13:2)%B"
EVENT_ENC id=14  fwd_id=LED_MATRIX:14  fwd_to_lcd=1  type=CC chn= 1 cc= 29  label="ENC #%3i    %3d@(1:14:2)%B"
EVENT_ENC id=15  fwd_id=LED_MATRIX:15  fwd_to_lcd=1  type=CC chn= 1 cc= 30  label="ENC #%3i    %3d@(1:15:2)%B"
EVENT_ENC id=16  fwd_id=LED_MATRIX:16  fwd_to_lcd=1  type=CC chn= 1 cc= 31  label="ENC #%3i    %3d@(1:16:2)%B"
type=CC chn= 1 cc= 16  lcd_pos=1:1:1  label="ENC #%3i    %3d@(1:1:2)%B"
type=CC chn= 1 cc= 32  lcd_pos=1:1:1  label="ENC #%3i    %3d@(1:1:2)%B"
type=CC chn= 1 cc= 48  lcd_pos=1:1:1  label="ENC #%3i    %3d@(1:1:2)%B"
type=CC chn= 1 cc= 64  lcd_pos=1:1:1  label="ENC #%3i    %3d@(1:1:2)%B"
These commands will map the first hardware encoder (hw_id=1) to the EVENT_ENC elements 1, 17, 33 and 49, which will send different CC numbers. EVENT_BUTTON id=  1  type=Meta   meta=SetBank button_mode=OnOnly range=1:1  lcd_pos=1:17:1 label="Bnk%q"
EVENT_BUTTON id=  2  type=Meta   meta=SetBank button_mode=OnOnly range=2:2  lcd_pos=1:17:1 label="Bnk%q"
EVENT_BUTTON id=  3  type=Meta   meta=SetBank button_mode=OnOnly range=3:3  lcd_pos=1:17:1 label="Bnk%q"
EVENT_BUTTON id=  4  type=Meta   meta=SetBank button_mode=OnOnly range=4:4  lcd_pos=1:17:1 label="Bnk%q"